As some of you have noticed, I rarely talk about stores and restaurants that are specifically "Atlantan". Don’t get me wrong, I go out to eat all the time…and when I’m not eating, I’m shopping or talking about eating. I don’t give many shout-outs on this blog because I think that me talking about it is sort of redundant. There are lots of great sources about Atlanta information – AtlantaCuisine is a great site with all sorts of info. There’s also The Blissful Glutton, who does a bang up job of covering the dining scene here. 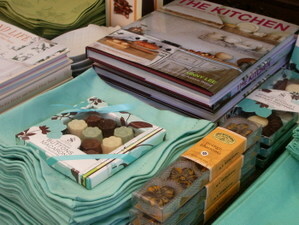 I am making an exception to tell the world about my favorite food store – Savor. It’s located in a charming little space in the Buckhead area of Atlanta. Opened two years ago by January and Ren Hodgson, its become the go-to source for every local foodie I know. It’s almost a sure thing for me to run into someone I know every time I go there. 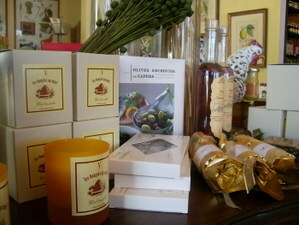 The store is a great mix of home goods, tablewares, serving pieces and gourmet goodies. It’s so well thought out and well merchandised, which comes from January’s background in specialty food retail. What drew me to Savor initially was the cheese selection. 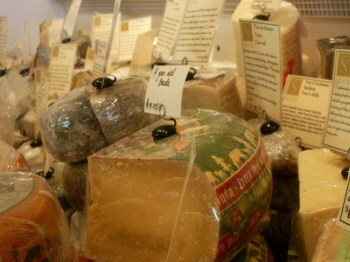 At any given time, there are between 75 and 100 cheeses in the case in-store. January is so knowledgeable and just a joy to talk with. You can trust that if its in the store, she’s tasted it and its great. If she says I need to try something, I do. Exploring the store some more, I’ve added so many of their products to my regular cooking routine. 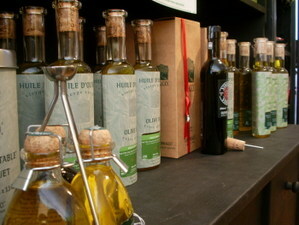 The olive oil from Greece featured in the photo above is something that I first tried at an olive oil tasting held at Savor – I’ve been using it at home ever since. Ditto the balsamic vinegar with figs, the charcoal crackers…the list goes on and on. This post is mainly about Savor…but I’m also writing about this because I feel very strongly in supporting independent retailers and suppliers of products, particularly when they’re this knowledgeable, like-able, and concerned with the quality of the products they’re selling. I’m a big fan of supporting "the little guy" in a time where markets like Whole Paycheck seems to be muscling a lot of people out of the way. If I can put my money into the pocket of someone who is doing it their way – like the folks at Savor – it’s worth the extra effort. It would be silly to move to Atlanta for a store, wouldn’t it? But the cheese looks so good…. Nice! Can’t wait to visit while I’m in town for the next few days. Thanks!